There is a great restaurant in Los Angeles called Food that serves up a delicious kale salad. I'd never had anything like it and when I found out the dressing was made with cashews, I knew I had to try and recreate it at home. Rather than throw in a lot of additions, I wanted to keep it simply to kale on this batch so I could test out the flavor of the dressing. If you want to throw in some shredded carrot and broccoli, I'm sure it would be delicious. Even the boyfriend enjoyed this and kale is way too heathy an ingredient for him in most cases. Rinse the kale and chop into small, salad-sized pieces. Place the cashews in a food processor along with the lemon juice, garlic, salt and half of the water. Run the processor until a chunky paste starts to form. Add the remaining water to thin out the paste enough to a thick dressing consistency. Add the cashew dressing to the kale and mix thoroughly. Add any additional veggies that you want and enjoy! 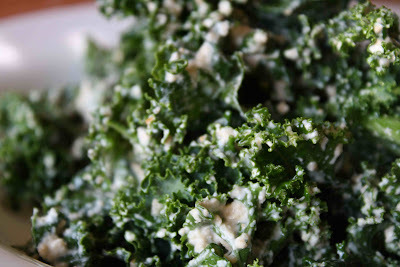 I have never had Kale, but it seems that all the bloggers love it! I think it is time to give it a try! Looks good as usual. Check out my blog for an award that I want to pass on to you- I'm not completely techno-savvy so if you can figure it out, you're one better than me. Wow, it doesn't get any easier than that. This really sounds delicious and I totally want to try this. Healthy too! i will have to try this out! i have bought kale before and the dishes i made never really turned out! PCC is a local Natural local food chain in Seattle. They have a winter salad which has kale and swiss chard in it and a creamy dressing. It's my favorite salad there by far. It's also the only way my six year-old will eat those greens. Thanks for posting this wonderful salad. I can't wait to try it.